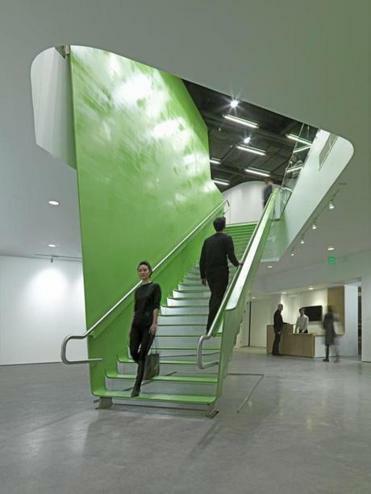 The Green Stair at the Boston Society of Architects headquarters is a welcoming sight, from outside and in. The Green Stair sits behind glass, looking out at the world as if it were posing in a picture window. It feels as if it needs capital letters, like the Green Monster. It’s more than a stair. It’s a totem, a logo, an emblem. 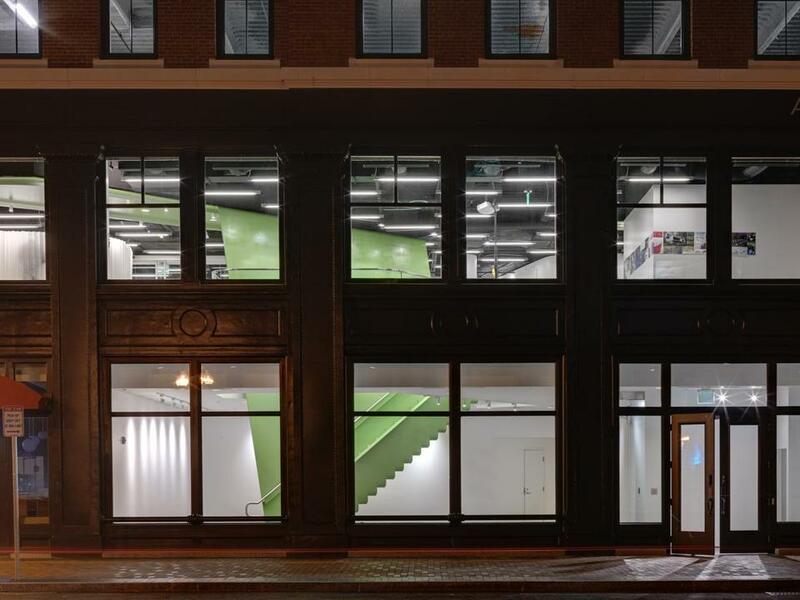 What it’s an emblem of is the new headquarters of the Boston Society of Architects. If you leave the sidewalk and climb the stair, which you’re quite free to do, you’ll find yourself in the BSA’s new home on the second floor of a waterfront building on Fort Point Channel. You’ll be in what the BSA is calling BSA Space, which, at 16,000 square feet, more than triples the area of the BSA’s former downtown home at 52 Broad St. The whole point is to engage the world of architects with the general public. The BSA plans to fill the space with architectural exhibitions, talks, school groups, whatever. There will be free space for community meetings. Starting next spring, there will be architectural boat tours from two dedicated slips on the channel. The official opening date was Friday, with further celebrations planned for the coming weeks. Some of those will be invitational, but the Green Stair door is to remain open to the public at all times. BSA Space - the name maybe sounds too corporate - is located in Atlantic Wharf, formerly known as Russia Wharf, next door to the Federal Reserve tower on Atlantic Avenue. The BSA’s second-floor windows look across the water toward the Boston Children’s Museum and the future Tea Party Museum. Icons don’t always come cheap. The Green Stair cost the BSA $530,000. It was manufactured in Michigan and shipped to Boston as one huge piece of steel. Elegantly detailed, it’s a sculpture in its own right. The stair is the brainchild of the architects who did the BSA renovation. They are the firm of Höweler + Yoon. Eric Höweler and Meejin Yoon are married partners. Höweler teaches architecture at Harvard, and Yoon teaches at MIT. They’re especially interested in projects that blur the distinction between architecture and art. They’re best known for “White Noise/White Light,’’ a media show they created at the Acropolis in Athens for the 2004 Olympics. So why the Green Stair? Says Höweler, “The problem was that the BSA was on the second floor, where it might not have been visible to the public. Now, looking from the sidewalk, you see the stair leading up, and then you see it again behind the second story windows. You know right away there’s something interesting up there.’’ Tucked upstairs, the BSA needed a show window to the world. It’s a case of an architect seeing a problem and solving it with flair but also with practicality, which are two of the qualities architecture is supposed to possess. There’s elevator access, too, of course, but most people take the intriguing stair. Once you get up to the BSA, you find that much of it - 6,000 square feet - is devoted to exhibition galleries. Most of the indoor walls are glass, which means that the working staff at their desks will be on permanent display to gallery visitors, and vice versa. Nobody seems to mind. There’s the sense of a genuinely public place where everyone can mix. The space feels airy and loose. And as a contemporary interior in a historic building, it feels very Bostonian. There are a couple of problems. Most of the galleries are located along the outside windows, where they get too much sunlight and glare. And there’s no personal storage for the staff, most of whom now stuff their possessions under their desks. Atlantic Wharf as a whole is also a typically Boston merger of new and old. A block of seven-story older warehouses has been renovated, and a 22-story modern tower plopped down on top of them. The result could have been horrific, but in fact Atlantic Wharf is well done. There’s a mix of apartments and offices, with restaurants and other lively uses at the sidewalk level. The BSA is in one of the older buildings, which dates from 1897. The owner, Boston Properties, needed to satisfy state and city laws that require a certain amount of public use on any waterfront site. The BSA fulfills that purpose and, as a result, gets a break on the rent. The BSA paid $1.9 million for renovations. The BSA’s kick-off exhibit opened on Friday. Curated by a trio of youngish South End architects who run a gallery called pinkcomma - yes, it sounds like a rock group - the show is mostly a backward look at the past half century in Boston. It argues that architects were once more deeply involved in creating a public world than they are now. The exhibit is too big and diverse to describe in detail. Among many pleasures, it’s nice to see homage paid to the world-class work done for the MBTA in the late 1960s. That was when the architectural firm Cambridge Seven Associates invented the T symbol, the color-coding of transit lines - Red, Green, Orange, and Blue - and a system of maps, signs, and graphics that became a model for cities in Europe and elsewhere. The show comes up to the present with three fine recent buildings: the Cambridge Public Library, by William Rawn Associates; the Community Rowing Boathouse on the Charles River in Brighton, by Anmahian Winton Associates; and the Boston Harbor Islands Visitor Pavilion on the Greenway, by Utile. The point is that Boston architects are still creating good, useful, imaginative public places. Pinkcomma plans a second BSA exhibit for June, on the topic of bicycles in the city. Is something changing? Architects, at least those who work in modernist styles, are sometimes accused of being elitists who worship an esthetic of their own. Are they now reaching out to engage a larger public? In fact, what’s happening in Boston is part of a national trend. The Chicago Architecture Foundation led the way many years ago, offering tours and museum exhibits of the famous architecture of that city. Now, quite suddenly, more and more places are following suit. Just in recent months, the architects of Washington, D.C., and North Carolina have opened public facilities very much like Boston’s. Architecture is the art about which everyone has an opinion. If the new BSA Space gets more of us talking with one another about the city, it will be a winner. And the Green Stair? I see it as a signal flag, a marker of one place where that conversation will occur.